Adequate fiber intake is vital for a healthy digestive tract. It helps prevent digestive problems such as constipation, hemorrhoids, irritable bowel syndrome and diverticulosis. Recent research has found that a fiber rich diet can help lessen heartburn and may even help reduce the risk of colon cancer. Health experts recommend eating 25-35 grams per day. Dietary fiber is the indigestible part of plant-based foods. Fruits, vegetables, whole grains, nuts, seeds, and legumes all provide fiber. There are two main types found in these foods: soluble and insoluble. All fiber-containing foods contain some of each fiber with certain foods containing more of one type. Soluble fiber dissolves in water and is found in flaxseed, oats, beans, peas, apples, carrots, citrus fruits, and psyllium. In addition to its role in digestive health, this type of fiber is credited with helping lower cholesterol and improving blood sugar control. 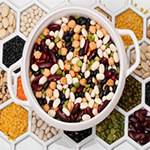 Insoluble fiber is responsible for moving bulk through the digestive tract. Whole grains, bran, nuts, seeds, fruit skins, and many vegetables are good sources of insoluble fiber. Some foods are good sources of both soluble and insoluble fiber; including flaxseeds, whole grain oats, and barley. Choosing a wide variety of fibrous foods every day will help ensure you get a good mix of both soluble and insoluble fiber. Prebiotics are a special type of fiber that help feed the “friendly” bacteria in our GI tracts, otherwise known as probiotics. Inulin and Fructo-oligosaccharides (FOS) are two prebiotics. They can be found in artichokes, asparagus, bananas, and onions. Stoneyfield Farm has recently added inulin to their yogurt product line. Yogurt is a good source of probiotic bacteria. Several studies suggest that these bacteria help boost digestive health and immunity and may help reduce the risk of some cancers. All plant-based foods will provide some fiber, but a high fiber menu which includes the following foods will give you higher fiber intake. They will help you easily reach the 25-35 grams of fiber you need every day. •	Start slowly by adding one extra serving of a high fiber food every few days and increase fluid intake. •	Start the day with high fiber cereal (more than 5 grams of fiber/serving). •	Carry convenient high fiber snacks like dried fruit, nuts, or baby carrots. •	Sprinkle ground flaxseed or wheat bran on foods like cereal or yogurt. •	Aim for 5-9 servings of fruits and veggies every day. •	Always choose whole grains (whole wheat pasta, brown rice, whole oats, etc..). •	Mix in frozen veggies to pasta sauces, soups and casseroles. •	Have fruit for dessert. Fiber Supplements are available in pills and powders for those who cannot meet their needs with diet alone. A few common ingredients include psyllium husk, guar gum, and hemicellulose. Don’t take fiber supplements with medication or other supplements because they might interfere with absorption. Also drink plenty of water, at least 6-8 glasses a day to prevent constipation.